Do you ever get bored of an ordinary leafy green salad? Sure they are good for you, but sometimes you just need to mix it up. Who said salad always has to start with greens? Why not try replacing a bed of lettuce with a savory grain, such as farro? OBC Eats introduces a twist to a salad with farro, drizzled in organic honey and topped with an apple–the perfect balance between tart and sweet. With its slight taste of cinnamon, and nutty flavored farro is a complex carb, which breaks down slowly, therefore helping keep your energy level stable. This can be extremely useful to help prevent that mid-day crash. But how exactly to incorporate this grain into your lunch routine? Farro Salad Bowl: * Try to use organic and local products when possible. I start by cooking my farro the night before and letting it cool down in the fridge. Crush a handful of pecans and roast them in the oven for 15 minutes to give them a more crunchy texture. Once complete, I toss the pecans into a bowl with a cup of farro, a handful of raisins and diced up half of an organic apple. Mix together 1 TBSP. of organic honey, 1 tsp. each of olive oil, apple cider vinegar and apple juice. 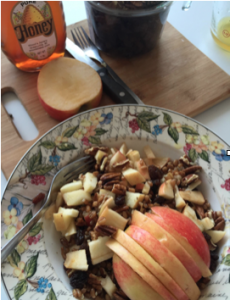 I whisk these ingredients together and drizzle on top of my farro, raisins pecans and diced apples. Lastly, I add the other half of my apple on top of my dish to complete the meal for a delicious yet fulfilling lunch. What types of salad have you made that involves grains? Let me know in the comments below!